Wheat, corn and soybeans are the three most important agricultural raw materials traded worldwide. The market situation, quality and price determine whether these commodities are sold as foodstuffs, biofuels or animal feed. The next most important global commodities of this type are sugar, palm oil and rice. Four companies dominate both the import and export of agricultural commodities: Archer Daniels Midland, (ADM), Bunge, Cargill and the Louis Dreyfus Company. Together they are known as the “ABCD group” or simply “ABCD”. ADM, Bunge and Cargill are US firms; Louis Dreyfus has its headquarters in the Dutch capital, Amsterdam. All four were founded between 1818 and 1902. Apart from ADM, they are controlled by their founding families. They trade, transport and process many commodities. They own ocean-going ships, ports, railways, refineries, silos, oil mills and factories. Together they account for 70 percent of the world market of agricultural commodities. Cargill is the biggest firm, followed by ADM, Dreyfus and Bunge. Customers of ABCD include feed manufacturers, meat producers, biofuel producers and food retailers. They are often of prime importance for their customers because they can ensure a steady supply of raw materials in large quantities. Cargill is the only one directly involved in meat production and marketing. It also holds 25 percent of the global trade in palm oil. Recently, the Chinese state-owned grain trader Cofco caught up with ABCB and replaced it as the main buyer of Brazilian maize and soya. ABCD’s share in Brazil’s grain exports fell from 46 percent in 2014 to 37 percent in 2015; Cofco accounted for 45 percent. 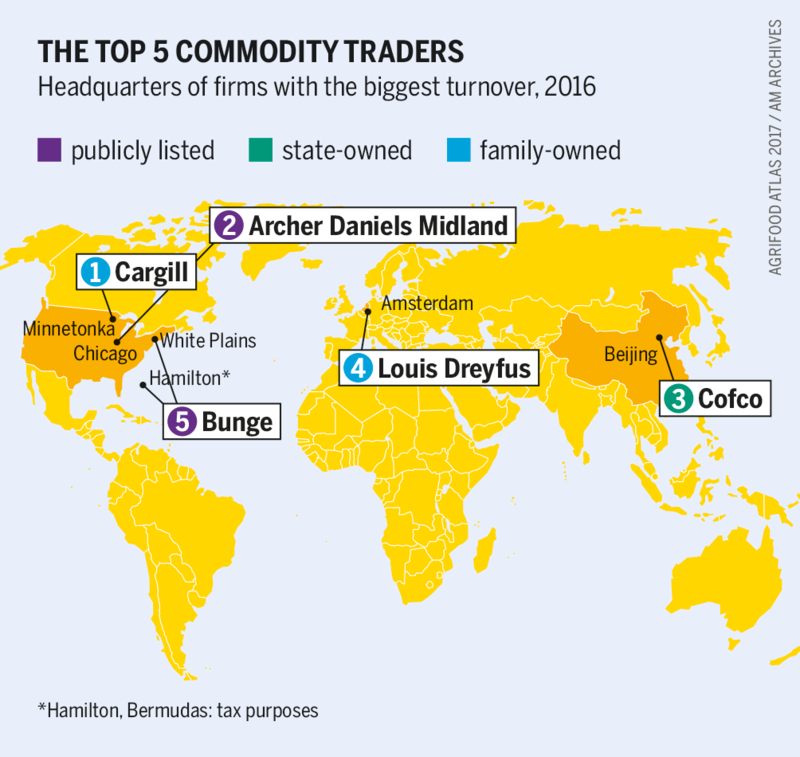 In Russia, the grain trader RIF took top spot as exporter in 2015, overtaking the previous three dominant traders: Glencore from Switzerland, Cargill (the only ABCD member) and Olam from Singapore. This reshuffling reflects the emergence of Russia as an important grain exporter and China as a major importer. The ABCD group is well informed about harvest levels, prices, currency fluctuations, weather data and political developments in all parts of the world. Every day, data gathered from growing areas is analysed by financial experts. All four companies have subsidiaries that hedge the trade of agricultural commodities against price-related risks and engage in speculative transactions on futures exchanges, especially in Chicago. The software and media company Bloomberg calls Cargill the "Goldman Sachs of agricultural commodity trade" in reference to the US bank’s reputation of being well-informed. In a 2001 corporate brochure Cargill described itself as: "We are the flour in your bread, the wheat in your noodles, the salt on your fries. We are the corn in your tortillas, the chocolate in your dessert, the sweetener in your soft drink. We are the oil in your salad dressing and the beef, pork or chicken you eat for dinner. We are the cotton in your clothing, the backing on your carpet and the fertilizer in your field". Extreme price fluctuations in global agricultural markets do not threaten Cargill. On the contrary, the firm benefits from them. Early on, the company's experts recognized the huge harvest shortfall of 2012. They speculated on increased prices for soybeans, wheat and corn, and made favourable future purchase contracts that could be traded on the stock exchange. When prices rose, they sold these contracts, making a considerable profit. In 2016, Cargill and its three major competitors made less money as a result of low world prices and fluctuations. 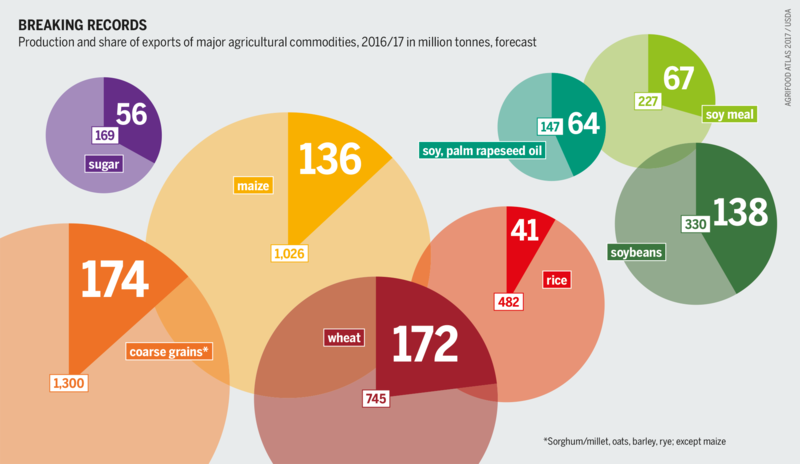 Trade in agricultural commodities has traditionally been the focus of the ABCD group, but it is declining in importance. Processing cereals and soybeans as well as manufacturing foods such as orange juice or chocolate have long been a part of their business. Since the 1980s, vertical integration – the combination of two or more stages of production in one firm – has become increasingly important. In 2014, ADM bought up three companies that turn nuts, legumes and fruit into food ingredients and flavouring for beverages. Fatter profit margins and fast growth beckon. Bloomberg once said that Cargill was not only part of the value chain but was the chain itself – from the field to the shop counter. ABCD also invests in related industries such as agricultural fuels, plastics and paints. In Hamburg, ADM operates the largest oilseed processing and refining complex in Europe. It turns rapeseeds and soybeans into margarines, pharmaceutical glycerine and biodiesel. The ABCD group uses its market clout to influence the world’s agricultural markets. Its members apply their enormous bargaining power to negotiate prices with producers, and use their market knowledge to achieve high returns from financial transactions. In addition, they are directly or indirectly responsible for the deforestation of the rainforest. In Brazil, indigenous Guaraní communities accused Bunge of buying sugarcane produced on stolen land, and although Bunge thought that its suppliers had respected land rights, it did not renew their contracts. In contrast, several British and US retail chains have refused to purchase Uzbek merchandise in protest against the forced child labour in cotton plantations there – nevertheless Cargill has remained a major buyer of cotton in Uzbekistan.